Those few minutes of alcoholic bliss where drinks come cheap and those frowns are turned upside down. Even though both those statements may be a tad bit exaggerated, there is something special about the idea of happy hour. And as a visitor to Cozumel or even a local, sometimes you just want to know where to go for that good deal. 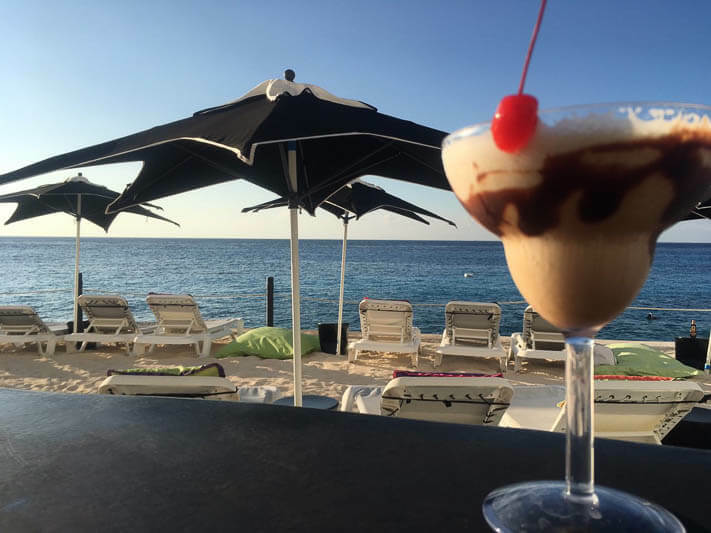 We’ve scoured the internet and hit the bars to bring you the top 10 Cozumel restaurants for happy hour. 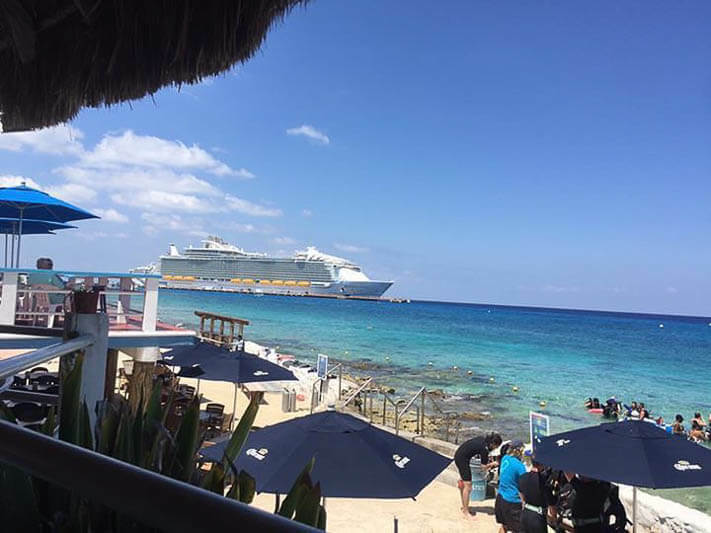 With such breathtaking tropical beauty on the island, we wouldn’t blame you if you felt that every hour is happy hour in Cozumel. But where do you go to get a drink to wash down with that joy to make it an extra dose of happy hour? At these following Cozumel restaurants and bars. 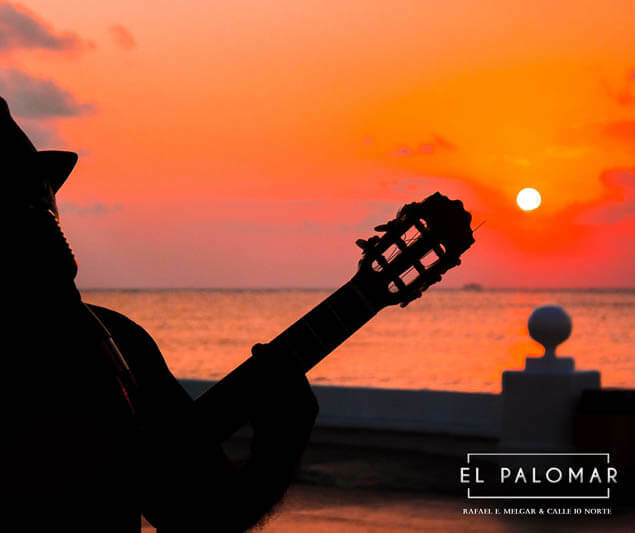 Set in a beautiful colonial-style house with a stunning view and some great art hanging on the walls, El Palomar is a great place to get a drink or a bite to eat in Cozumel. Great ambience, good food, and lots of style. 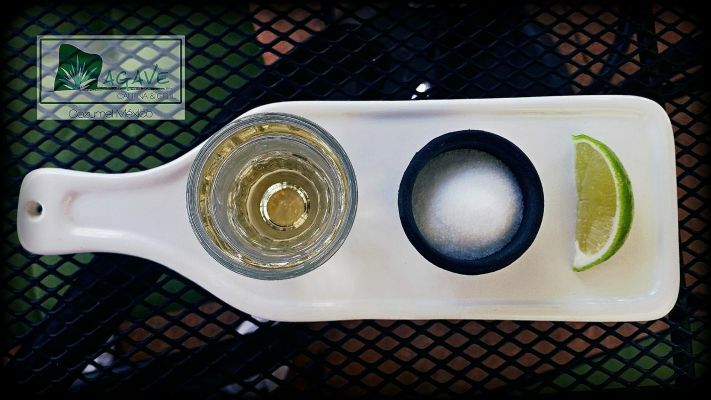 Happy hour: Tues. – Sat., 6:00 p.m. – 9:00 p.m. 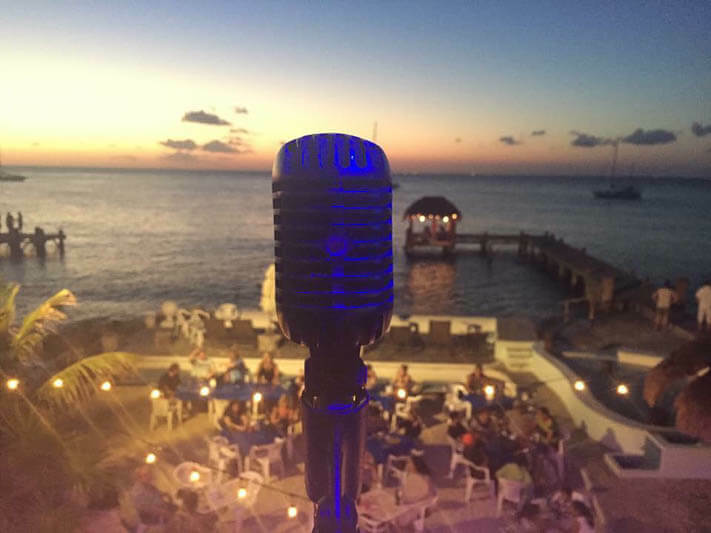 Speaking of views, few places beat this place in terms of a great place to catch a drink and watch a spectacular Cozumel sunset. 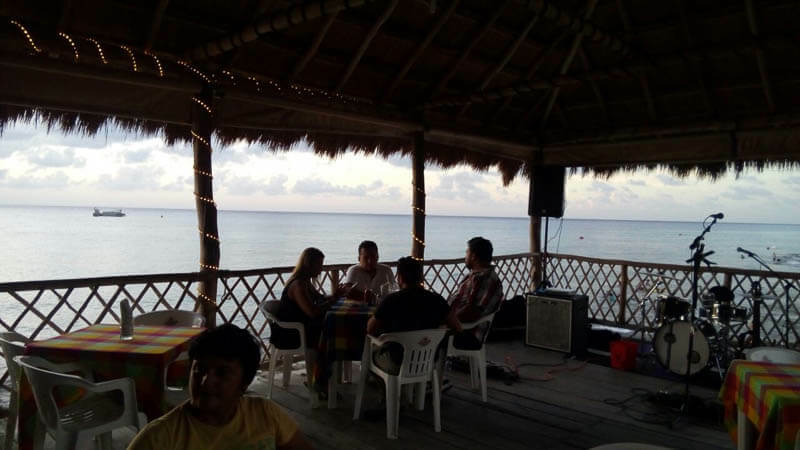 Sunset Beach is a spacious restaurant and bar not far from the cruise dock in Cozumel. 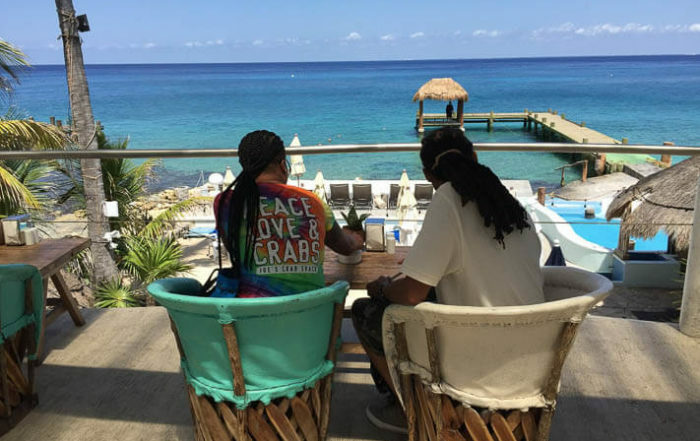 While we can’t attest to the food, we can to the fact that this particular happy hour comes with a gorgeous view of the Caribbean Sea. Happy hour: Daily, 1:00 p.m. – 3:00 p.m.; 5:00 p.m. – 7:00 p.m.
Just down the road from Sunset Beach sits Turquoise. This hip beachfront bar serves up a great array of cocktails and boasts live music several nights a week. 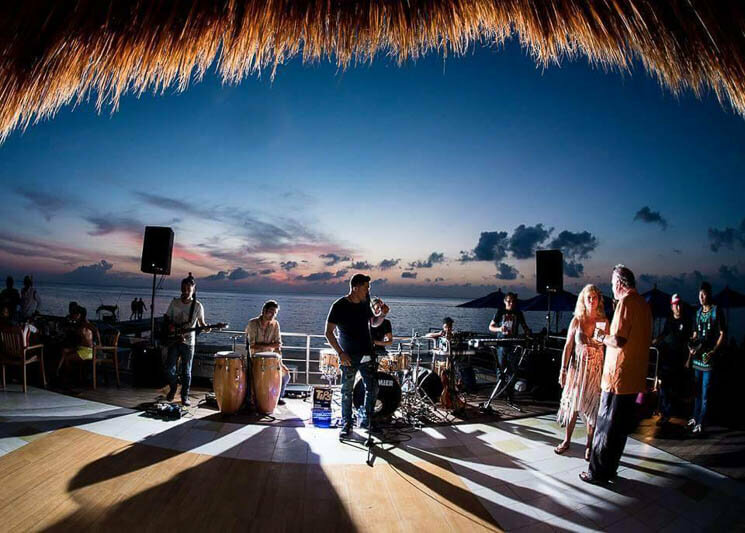 Set on a wooden deck and with spectacular views of the Caribbean Sea, this is the place to enjoy happy hour in style. Word on the street is that the food is pretty good here too. Happy hour: Mon. – Sat. 1:00 p.m. – 3:00 p.m.; 7:00 p.m. – 9:00 p.m.
Blue Angel is the charming restaurant located at the hotel by the same name. 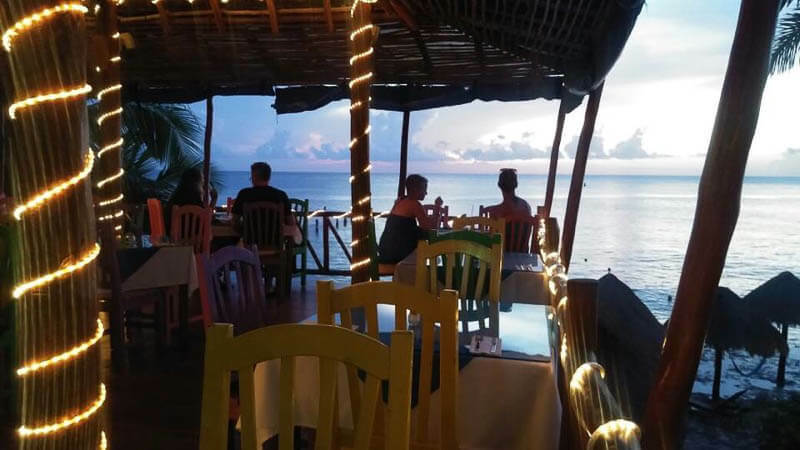 A delicious beachside location combines with a great menu, a cozy rustic ambiance and, seeing as this is Cozumel, fantastic seaside views. This one comes highly recommended, especially if you’re looking for a more unique setting. Happy hour: Daily. 4:00 p.m. – 6:30 p.m.
Money Bar is definitely one of the more popular spots on the island, and it just so happens to be a great place to go if you want to try out a little snorkeling from the beach. 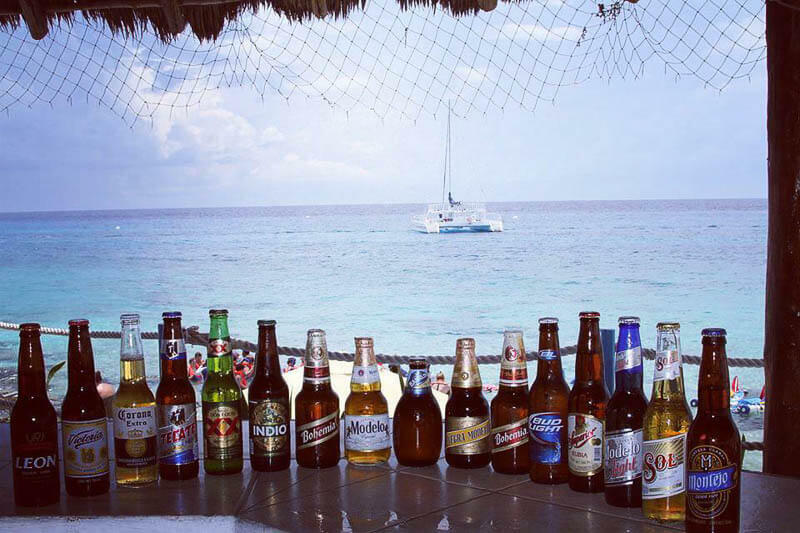 Plus, they have a daily happy hour to keep you smiling and raising your bottles and glasses in a toast to the beauty of Cozumel Island. Food and service here are both above average and the vibe is more party than chill. Happy hour: Daily. 5:00 p.m. – 7:00 p.m. Normally when we mention the views of Cozumel we’re talking about the stunning beaches and beautiful sunsets. Agave, however, offers another type of view that is great for something else: people-watching. Located in the main square in downtown Cozumel, this is a great place to have a seat, grab a bite to eat, and enjoy those happy hour specials as you watch the people go by and the kids play at the fountain. Happy hour: Daily. 7:00 p.m. – 9:00 p.m.
Have you noticed that most of these places come with a great view? El Bungalow is no exception. 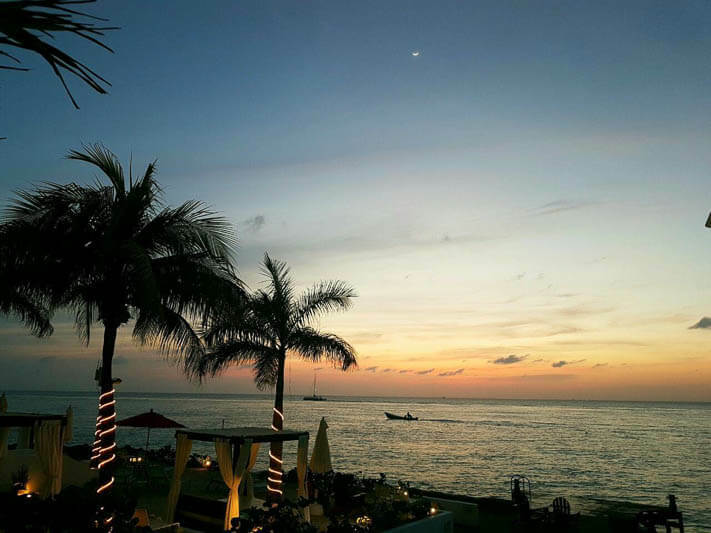 Luckily for us, many of the places that offer happy hour just so happen to overlook the Caribbean Sea. As numerous reviews on TripAdvisor attest, this isn’t the place to go if you’re in a hurry. However, if you’re looking for some chill seascapes to take in with while you imbibe in the tropical spirits, El Bungalow is a great option. Happy hour: Daily. 5:00 p.m. – 8:00 p.m.
We often mistakenly think that hotel restaurants are off limits to non-guests. That’s actually not the case for many hotels, and it’s definitely not the case for the gorgeous Hotel B. A spectacular ambience combines with great food and — wait for it — awesome views to offer a spectacular way to live it up for two liquor-infused happy hours. Another hotel open to the general public for eats and drinks. Happy hour here is short but sweet and divided into two. The first stretch of 2×1 drinking starts at the pool bar and continues a few hours later at the hotel’s El Cayuco restaurant & bar. This charming lounge lies a bit outside the typical tourist zone of Cozumel. 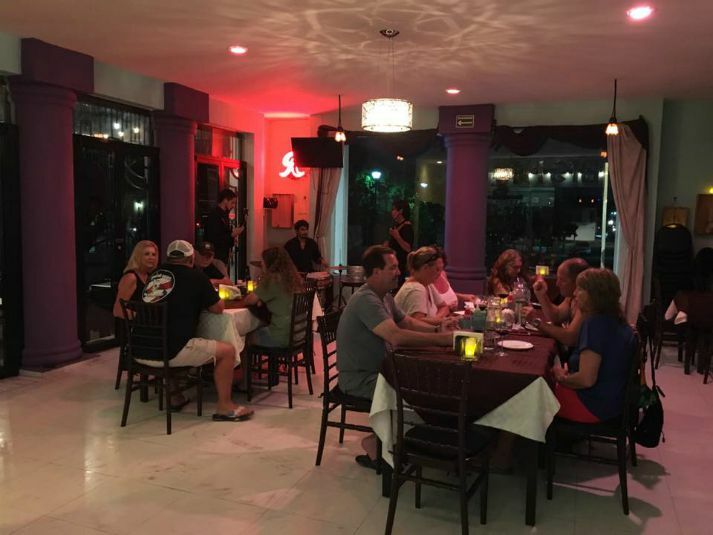 Set off in the residential area known as Corpus Christi, Chillin’ Bistro & Lounge is a quaint restaurant and bar with a great tapas menu, a good selection of wines, live music most nights, and daily specials that aren’t exactly happy hour but earn this bistro bar a place on this list. Be sure to try their awesome selection of tapas! Is there somewhere we missed?